Astro Barrier is a mini game on Club Penguin located upstairs in the Dance Lounge. The Dance Lounge can be found by going to the Dance Club then going upstairs. 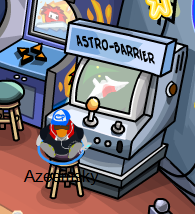 Astro Barrier is one of the games in the Dance Lounge that you can play to earn coins to buy stuff around the island. The object of this game is to shoot all the green targets on each level of the game. The game gets progressively harder and is a very challenging game as the levels progress. To play Astro Barrier you use the keys on your keyboard to navigate your ship. In addition to the keys on the keyboard you use the space bar to shoot lasers at the targets moving across your screen. Before you start the game you can automatically skip to levels 10, 20, or 30 by pressing either 1, 2, or 3 on your keyboard. While you are playing the game you will come to checkpoints in the game that tell you more rules about the game. After level five in this game you will see the loading screen for the next level but you have to be a member to precede with this game after level five. Also during the game you will notice several different checkpoints in the game explaining the new factors added to the game. Just before level seven you will notice a checkpoint explaining the extra life rules for the rest of the game. To get an extra life in Astro Barrier you have to hit the blue targets before you hit any other targets in that level and you will receive an extra life. The next checkpoint you will encounter in this game is before level 11 in this game. Before level 11the game tells you about the orange switches in the game. If you hit the orange switches you see in the future levels the orange wall blocks will disappear and you will be able to access the blocked targets. Also at this checkpoint you can access the first set of secret levels in the game. To access these levels wait 30 seconds until the blue spaceship appears and instead of hitting enter and advancing to the next level shoot the blue ship. You will then get taken to the first set of secret levels. There are ten secret levels that you can play to get more points but these levels get more difficult as you progress with these levels. After you complete all these secret levels you will get taken back to the normal game and you will be on level 16.You will notice another checkpoint in the game. This checkpoint tells us about the yellow targets or barriers that are in the game. To destroy these targets you have to hit it twice for it to be destroyed. Later in the game you will come to another checkpoint just before level 31. This checkpoint tells us about the blasters that have been added to the game. The blasters shoot at the same time your ship does. These blasters can help you if you have a target you can’t reach and the blaster can. Also the blasters don’t have to be destroyed in order to progress to the next level. Also at this point you can access the Expert Secret Levels in this game. In order to access these levels you have to shoot the blue spaceship when it shows up on the screen. Once you shoot the ship you will be taken to the the Expert Secret Levels. There are 10 levels in this section and these levels are very hard and take time and patience to get past. You may not get past the levels in your first try but you just have to keep trying. Once you finish the Expert Secret Levels you will just have a few more levels in the game then you are done. The last level in Astro Barrier is level 40. If you make it through all the levels including the secret levels you will make a lot of coins in a pretty small period of time. This game takes a lot of skill and patience but im sure after you have had enough practice you will beat all the levels of Astro Barrier!